In 12-inch nonstick skillet, mix Seasoned Ground Beef and Sausage, uncooked rice, tomato paste, 3/4 cup of the soup and the green chiles. Cook over medium heat until thoroughly heated, stirring occasionally. Remove from heat; stir in 1 cup of the cheese. Spoon mixture evenly into pepper halves. Place filled peppers in same skillet. Pour remaining soup and the water over peppers. Cover tightly with foil or domed lid; cook over medium-low heat 20 to 25 minutes or until peppers are fork-tender. Remove skillet from heat. Sprinkle peppers with remaining 1/2 cup cheese. Cover; let stand 2 minutes or until cheese is melted. To serve, spoon sauce mixture from skillet over peppers. If the lid doesn't fit over the peppers, use foil instead. 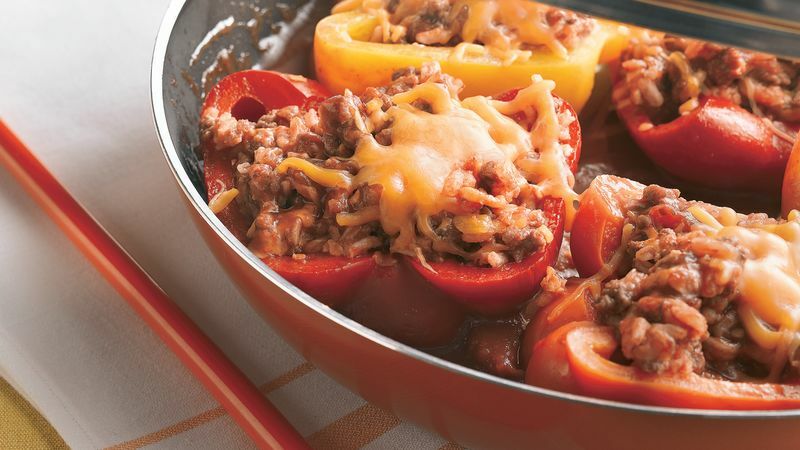 Red, yellow, orange or green bell peppers can be used in this recipe. A melon baller works well to remove the seeds.